My 3rd Great Grandfather – John McArdle Sr bought land in Vermilion county in 1837 whereas the Corbly’s moved to Illinois between 1860 and 1870 and the Eldridge’s before 1859 – with most around that same time period. The public land purchase records for the time period when John McArdle moved to Illinois are available. He relocated to Illinois from out east and purchased land in 1836 and 1837 (purchasing 40 acres in each year). His wife, Nancy Morgan (d. 1839), relocated with him and but passed away shortly after moving to Illinois. Danville was founded in 1827 on 60 acres (240,000 m2) of land donated by Guy W. Smith and 20 acres (81,000 m2) donated by Dan W. Beckwith. The sale of lots was set for April 10, 1827 and advertised in newspapers in Indianapolis, Indiana and the state capital of Vandalia. The first post office was established in May of the same year in the house of Amos Williams, organizer of Vermilion and Edgar Counties and a prominent Danville citizen. Williams and Beckwith drew up the first plat map; the city was named after Dan Beckwith at Williams’ suggestion, although Beckwith suggested the names “Williamsburg” and “Williamstown”. Beckwith was born in Pennsylvania in 1795 and moved to Indiana as a young man; in 1819 he accompanied the first white explorers to the area where Danville later existed because of his interest in the salt springs of the Vermilion River. He died in 1835 of pneumonia contracted on a horseback ride back from Washington; he was 40 years old. Danville became a major industrial city in the late 19th and early twentieth centuries. From the 1850s to the 1940s, Danville was an important coal mining area; some of the first open pit mining techniques were practiced here. The coal formation underlying eastern Illinois and western Indiana is named the “Danville Member,” after the area where it was first discovered. We need go no farther than the fall of 1819. when a company of five men, Blackman. Beckwith. Treat, Allen and Whitcomb settled at Salt Springs, a few miles west of the present city of Danville. They were pioneers and speculators, in search of what was at that time was thought to be in the area – gold, silver, or salt. Salt was found to be a commodity in the area at one point as memorialized by the salt kettle that is now on display at the Oakwood rest area. Illinois was admitted into the Union December 3, 1818, and by an act of congress April 18, of that year. The first state constitution was adopted that year remaining in force until March, 1845, when a new one was adopted. The most important feature of this was a clause ordering an annual two mill tax to pay off the state debt. This constitution was in place for twenty-two years, when on August 8. 1870. With fifty-six thousand square miles of land in her Boundaries. Illinois has one hundred and two counties. Vermilion county ranks fourth with a thousand square miles. With the artesian outpour of pure water in unlimited quantities in the northwestern portion of the county ; with two and three six and seven foot veins of excellent butinous coal underlying the west and south- west portion of the county ; clay, sand and rock deposits favorably situated for utilizing at minimum expense, all well distributed throughout the county, such advantages are to be considered when determining upon locations for manufacturing and the investment of capital and enterprises, the success of which depends upon economical material and tile conversion of same into what is desired. Vermilion county is especially favored, in regard to its freedom from climatic extremes. The reason for this is that located as it is midway in the thermal jet between the thirty-ninth and fortieth degree of latitude, outside of the great air currents which follow the mountain ranges on both sides of the continental valley through which flow the water arteries north and south from the Arctic circle to the Gulf of Mexico – there is a lessened liability of barometrical disturbances which variations in pressure are primarily the cause of tornadoes, cyclones, gales and all of the variously named winds which benefit or harm mankind. The relation of climate, more especially the weather, to health, is an inquiry deserving of consideration. It will be found from statistics that this section of the state compares with the most favored, not only as regards diseases of the respiration system but is free from annual malarial diseases resulting from marshes and poorly drained alluvial soils. Recently the climate has suffered, most likely from the removal of the hedgerows, clearing of the land, and climate change in general. In the early part of 1827, Guy W. Smith and Dan. W. Beckwith donated land to the county for a county seat. Danville occupies that land at present. “There was an abundance of wood, water and grass” all easily obtainable. Evidences of the Native American’s use of this area was seen by the pioneer, their former village sites extending: from the crescents of the main Vermilion river on the south. Along the bluffs on the west, following the course of the North Fork to the Denmark Hills. Eastward to Stony Creek. The area was a plateau that was filled with forests of sugar maples, oaks, walnuts, elms and other trees. There was a story about a meat packer that intended building a boat at the foot of Vermilion street with gunwales and plank from trees and loading this boat for New Orleans with hams and bacon from hogs butchered on the ground over which the Wabash railroad now passes on the north side of the bridge. Equally strange to the is the fact that a little flutter mill on the North Fork, near the ground occupied by what was Custer’s icehouses, furnished the meal for mush and pones in 1834-5-6, for not only most of Danville’s citizens but the country round about. The amount that an individual could get ground was limited to a bushel, half bushel customers had the preference, although the rule of succession was as arbitrarily enforced as it is at a popular barber shop. Waiting for hours in sunshine or in rain to get a half bushel of corn mashed or cracked (it never was bolted) would not suit present customers who demand immediate attention in supplying their request by telephone and complain of the tardiness of the grocer or butcher if they fail in material or time. A matter which may be forgotten if not noted is this: there was a time in Danville’s history when there was no butcher shop or place where provisions could be obtained at all times; beef was killed on the square after having been thoroughly tested for milk sickness: if affected it was shown by trembling which gave the disease the name it was generally known by (trembles) it was the cause of many deaths among the early settlers. Milk, butter or Beef from towns or country northeast of the city was regarded with suspicion. 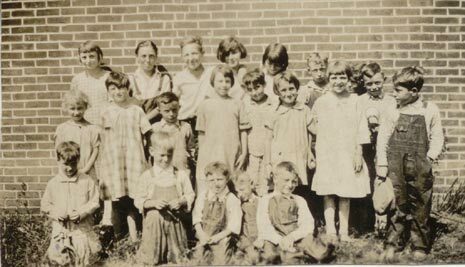 An English family of seven who had recently settled in Danville on the southeast corner of Hazel and North streets died in a week from eating butter coming a mile or so northeast from the junction. The father was a positive man who said there was not a bit of truth in the sickness coming from eating butter, that there was no such thing as milk sickness, that he would show the Hoosiers that he was right. Poor fellow, his family and himself might have escaped a fearful death had he been willing to accept facts and not stubbornly ignored them. This milk sickness is something which has eluded investigation: that it is the result of poison taken into the system from Beef, butter or milk is accepted by medical men whose practice has given them opportunities for investigation and treating” it. Danville’s fair name was clouded for years by the reported milk sickness and from the reputation it gained in the business transactions at the land office which was located there. The early immigration into this territory was from the southeast, the Carolinas, Tennessee. Virginia. Kentucky, southern Ohio and Indiana, furnished a majority of those who sought new homes and enjoy the free elbow room existing where neighbors were few and stock range unlimited. The government land office for this district was located in Danville in 1831-2. Samuel McRoberts (who afterwards was a United States senator) was the first receiver: J- C. Alexander the first register. This office remained until the public land or most of it was disposed of. This required some years, many receivers and registers serving in these responsible positions. Near the end though, the office was used by outsiders for personal profit to the detriment of its citizens which reflected upon Danville’s reputation and retarded its growth. Gold and silver coin alone was accepted for land by the government. This coin was stored in boxes and stacked up on the floor of the office until the joist would bend and the floor sag under the weight. Deposits were made at the treasury in Chicago, a wagon load of money was sent with no guard or protection except the driver and a citizen who had business in the Lake City, one hundred and twenty-five miles away, most of the way through a sparsely settled country. What an opportunity to burglarize vaults, safes and strong boxes, terrorize whole communities, and hold up railroad trains with impunity. Simple statements of every day life were filled with constant danger of robbery, murder and the contingencies of attacks by Indians and refugees and desperadoes that lived upon the borders of civilization. Danville and Vermilion county was able to utility the resources such as salt in the area which was undisturbed until the early 1900s. Danville’s first railroad was the Great of Illinois in 1859. 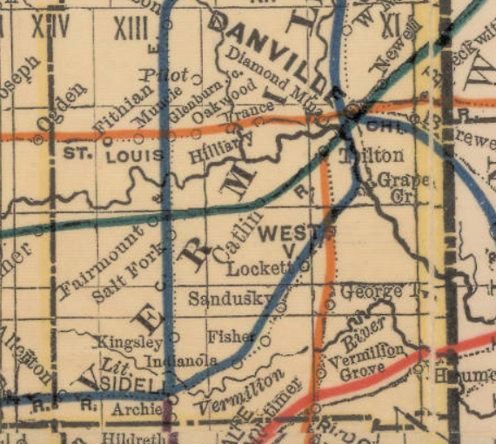 Consolidated with the Wabash in June of 1863. when a division was made from the state line to Danville, making Danville the terminal for east and west divisions. In December, 1869. the Indianapolis, Bloomington & Western was built into Danville from the west and from Danville east to Indianapolis in December, 1870. Chicago. Danville & Vincennes Railroad was completed to Danville in December. 1871 : the shops, engine house etc., during 1872. What is known as the Collett road from Terre Haute to Danville (a part of the Chicago & Eastern Illinois system) was completed into Danville December. 1871. The Paris & Danville Railroad (a portion of the Big Four system that later ran through Danville) was built in 1872. Included in the Fithian book written by Cannon is a letter from Dr. Fithian discussing Corbly’s deal with the railroad for the train station at Muncie and theorizing that Corbly would not be able to get enough water to fulfill the deal with the railroad. Shortly after the arrangement Corbly made with the railroad, he declared bankruptcy and left the area, only to return a few years later when he passed away at the home of his daughter. Family stories talk of him bringing cattle with Texas Fever up to his farm and causing the local cattle to all become ill and many farms to lose their herds. Texas Fever was a growing concern at the time, so it is a possibility. Trails and foot paths blazed through the woods were the only roads in the early days: no bridges! Rivers and creeks had to be crossed and in time of high water and floods travelers had to wait until the water subsided. Traveling was done on foot or horse back.